Cantaloupe (Cucumis melo) is commonly called muskmelon; however, no true cantaloupes are actually grown commercially in the United States. True cantaloupes are rough, warty fruit primarily grown in Europe, but in America “cantaloupe” has become the generic name of all netted, musk-scented melons. The Athena “cantaloupe” or muskmelon (Cucumis melo ‘Athena’) is a popular commercial variety that also growswell in home gardens. The honeydew melon is another group of melons. Honeydew melons usually have green or white flesh, although some newer varieties may have orange or pink flesh. Cantaloupe and honeydew are warm-season crops that grow best at average air temperatures between 65 and 75 °F. It is best to plant when the soil temperature is at least 60 to 65 °F. These melons are very tender and should be planted after the last chance of frost. Melons seeds can be planted directly in the garden or transplants can be grown to get an early start. Under normal conditions melons grown from transplants can be harvested as much as two weeks earlier than melons grown directly from seed. Another way to get an early start on your melon crop is to use black plastic mulch. The black plastic absorbs the sun’s warmth, allowing the soil to warm quickly. To plant, punch a small hole in the plastic and plant the seed or transplant. The black plastic will warm the soil faster in the spring and will also conserve moisture throughout the season. Other advantages of this type of mulch are weed control and a reduction of fruit rot. If a second crop or fall crop is going to be planted on the black plastic mulch, spray-paint the black mulch white. The hotter soils created by a black mulch become too hot during the summer and early fall. Spraying the mulch white reduces the amount of heat absorbed. It is best to use drip irrigation in combination with the plastic mulch. Using drip irrigation instead of overhead irrigation keeps the foliage dry and reduces disease problems. It is also possible with the appropriate equipment to inject the needed nutrients through the drip line and spoon-feed your plants. Cantaloupes and honeydews need a lot of space. Plant the melons in rows 6 to 8 feet apart. Transplants or seed should be planted in the rows 18 to 24 inches apart. If starting from seed, plant the seed about ½ to ¾-inch deep. Cantaloupes and honeydews need a lot of space in the garden. There are numerous very good cantaloupe varieties for the home garden. Athena, one of the more popular commercial varieties, would do very well in the home garden. Other possible cantaloupe varieties include: Ambrosia, Burpee Hybrid, Lilliput Hybrid, Park’s Whopper, and Scoop II. The recommended honeydew variety is Earlidew. It is best to base fertilizer applications on the results of a soil test. If a soil test has not been taken, apply 5-10-10 at 30 pounds per 1,000 square feet before planting. Melons should be sidedressed before the vines start to “run” with 1 pound of 34-0-0 (urea and ammonium sulfate) per 100 feet of row or 2 pounds of 15.5-0-0 (calcium nitrate) per 100 feet of row. Sidedress a second time after bloom when fruit is developing on the vine. 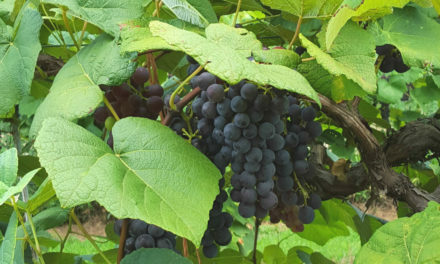 Be careful: Too much nitrogen fertilizer can encourage excessive vine growth and reduce fruit growth. Melons need a lot of water. If using overhead irrigation, water in the morning so the foliage has time to dry before dark. Wet leaves encourage foliar diseases. Drip irrigation works well as water is applied in the plant root zone but does not wet the foliage. When watering, make sure the soil is moistened to a depth of at least 6 inches. Melons need extra water during fruit set and development, but too much water during the last week of fruit development will reduce sweetness of the fruit. Honeydew melons are smooth skinned with green, white, orange, or pink flesh. About 30 to 35 days are required from fruit pollination to harvest for most cantaloupe varieties. Most honeydew varieties take a little longer. When the stem separates completely, called “full slip,” the cantaloupe fruit has achieved its maximum sugar development and if not consumed or cooled soon thereafter, its quality will deteriorate. Some honeydew varieties will not slip but will become paler in color. 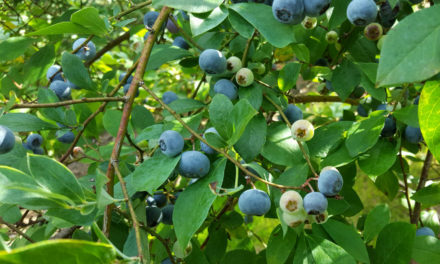 Poorly formed fruit or reduced numbers of fruit can be due to several problems, but lack of pollination by bees is one of the most common causes. Blossom end rot is primarily due to inadequate calcium in the plant. This may be due to low soil pH, low calcium in the soil, and irregular uptake of water. Applying too much nitrogen fertilizer or planting too close can cause the plant to produce a lot of vine growth and very little fruit. Insect problems are usually critical only in the seedling or early growth stage. Cucumber beetles and aphids are the most noticeable problem insects. For more information, see HGIC 2207, Cucumber, Squash, Melon & Other Cucurbit Insect Pests. Two of the least expensive and most effective disease control measures are crop rotation and the planting of resistant varieties. Do not plant after other melons or similar crops (such as watermelon, cucumber, squash, or pumpkin) for at least three years. Diseases and other pests that may be a problem include gummy stem blight, Alternaria leaf blight, downy mildew, and nematodes. For more information, see HGIC 2206, Cucumber, Squash, Melon & Other Cucurbit Diseases. Previous ¿Cómo Proteger los Árboles Durante la Construcción?